The two main villages which formed the Grand and Petit Tremblay, today called "Vieux-Pays", are vestiges of the feudal period. The Grand Tremblay was fortified in the middle-Ages as can be seen from parts of the wall remains on Rue des Fossés. It is the remains of the ramparts of the ancient castle of the abbot of Saint-Denis, the Blue Castle also called Tournelles castle. As for the town Petit Tremblay, we know that the abbot Suger 1081-1151 ordered its fortification. His dual-power of abbot and lord can be seen in the village decree. After Charlemagne strengthened the power of the church, he hung onto his possessions and expanded his domain. Louis the Pious, son of Charlemagne, offered the territory of Tremblay which was the charge of the royal treasury (the Crown property) to the abbot of Saint-Denis. The village which was then called Tremblay-Saint-Denis until the revolution of 1789 was then placed under the authority of the abbot of Saint-Denis, "lord" of the area. The Abbot of Saint-Denis taxed the land of Tremblay-en-France twice, as cleric with the tithe and as lord with fees solely seigniorial. 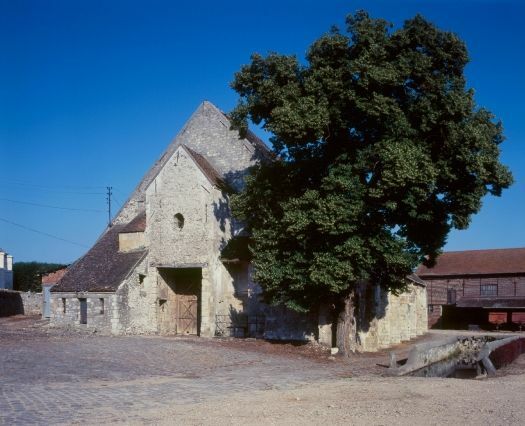 Being lord, Suger ordered the construction at Petit Tremblay of a barn to receive the champart – royalties-in-kind, typical of seigniorial dues. The champart (etymological "field" and "part") is a mixture of cereals (wheat, rye, barley) sown together and the seeds used as livestock foodstuffs. The amount due to the lord varied between one sixth and one eleventh according to the region. As a cleric, Suger used another barn, larger than the previous one, built in the courtyard of the former castle of Grand Tremblay, used then to collect tithes. In its place, The present day Grange-aux-Dîmes perpetuated the memory of a primitive building perhaps destroyed by fire. The monastic farm that owned this barn was the headquarters of the Castellany of the village, fortified by Suger, where the lands were administered and farmed for the abbot of Saint-Denis. The barn, rebuilt in the thirteenth century, taken over in the fifteenth century, and then in the eighteenth century was dedicated to collecting the tithe, which was six per cent (and not ten as is suggested by the name) of the local grain harvest, levied by the monks. This tax was paid in the form of sheaves of wheat. Huge in size, it exceeded the dimensions of the Church Saint Médard, located nearby, it is preceeded by a porch with an adjoining tower pierced with loopholes, which reflects the vigilance of the abbot about the safety of his revenue-bearing.